Portland - The Archdiocese of Portland's pending release of previously secret documentation of child sexual abuse by priests - and what church leaders did or failed to do about it - is a good start toward demonstrating a commitment to preventing child abuse. But it's just a start, according to two clergy abuse victims who settled their lawsuits years before the public spotlight focused on the problem in Oregon. Church officials and lawyers for abuse victims announced the document disclosure Tuesday as part of a bankruptcy reorganization plan that will pay at least $50 million to about 175 people who sued the archdiocese over clergy sexual abuse. Len Gattuccio talks about being abused by a priest when he was a teenager. The primary motivation for a victim to take the perilous step of publicly accusing a clergyman is to prevent further abuse by the perpetrator, the two men said. More than big payments, victims want better priest training, rigorous enforcement of anti-abuse policies, reconciliation among parishioners and abuse victims, counseling for victims, and outward signs of remorse by church leaders, they said. advertisement "The money, in some ways, is not even helpful. Your life is forever changed. 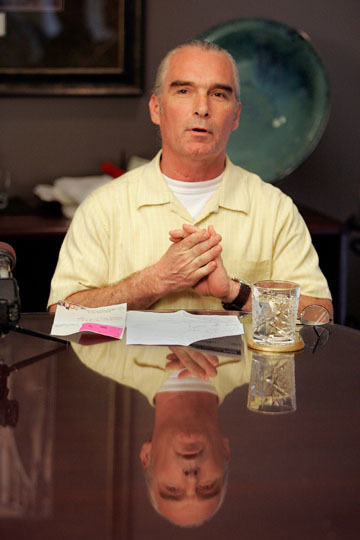 The money comes and goes," said Steve Fearing, a 51-year-old high school teacher who won a 1999 Oregon Supreme Court ruling that forms the legal cornerstones for hundreds of abuse claims filed against the archdiocese since then. The ruling put the church in legal jeopardy every time a priest used his position to groom and ultimately to sexually assault a victim. It also extended the church's liability under the same, longer Oregon statute of limitations that allows civil lawsuits to be filed decades after child sexual abuse occurred. Fearing said he filed his suit against the archdiocese and the Franciscan order in 1994, after a former schoolmate told him that the Franciscan priest, Mel Bucher, also had sexually abused him. Fearing said before that he thought that he was the only victim, that it was his fault and that he had committed the mortal sin of homosexuality "because priests don't do anything wrong." In 1994, he looked back on his long pattern of addiction and realized his self-destructive behavior was based on a belief that he was "going to hell anyway. What does it matter?" Ironically, he said, it was the church that first put a monetary value on his abuse when church leaders declined to pay about $10,000 for in-patient treatment that was recommended by a counselor hired by the church to help him. Instead, the church wanted to know how much it would have to pay to settle Fearing's claim. "They put the money value on it. I didn't. They started that ball rolling," Fearing said. After years in court, on the eve of the Supreme Court argument, the church offered Fearing $5,000 to drop the suit, said Kelly Clark, a Portland lawyer who represented Fearing. On the eve of a jury trial, the case settled for a confidential sum, he said. The archdiocese ended up paying 10 times the amount the Franciscan order had earlier paid to settle its part of the lawsuit, Fearing said. Bucher was allowed to remain in his post until the Supreme Court ruling, he said. Rather than address the issues of the case, the church chose a hardball legal route that left it with greater financial liability, Clark said. "They thought the law was on their side," he said. Six years after settling Fearing's suit, Archbishop John Vlazny on Tuesday stood in a news conference in Portland to announce the settlement of all current sexual abuse claims against the archdiocese. Vlazny repeated his earlier apologies to victims, church members and Catholic clergy who have suffered under the stigma of the abuse scandal. Vlazny said the unprecedented release of private church files illustrates the church's commitment to openness and accountability for the abuse. He voiced his hope that it will aid in the healing process and announced a public reconciliation service on June 13 at St. Mary's Cathedral in Portland. advertisement So far, it is just words, not real action, said Len Gattuccio, a retired 67-year-old banker who was abused in his early teens by Rocco Perone, a priest at St. Philip Neri parish in Portland. Gattuccio's family was deeply devout as he grew up a shy, insecure youth with "a lot of social problems" that Gattuccio later realized were related to the fact he was developing sexually as a homosexual. It was a secret he did not share. His mother turned to Perone, the Boy Scout chaplain, for help with her son's "problems." On top of the sexual abuse, Gattuccio said he suffered the church's berating judgment of his sexual orientation. The result was a loss of self-worth and a long, difficult struggle to find his place in society. After Clark and the church negotiated his settlement, Gattuccio said he was left with deep anger, and a belief that the most effective approach for clergy abuse victims is to inflict as big a financial blow as possible on the church. "Trusts, confidences, security and truth were eliminated from my life, and they have never been restored," he said. "And with them (the church), it is still about the money." After he filed suit, Fearing recalled that people confronted him for "going after a good priest." The process was "another whole life-changing event." "I want to respect the Catholic Church. I want it to believe it's a positive start," Fearing said. "I feel for the priests who are not abusers - what it's like to be them."